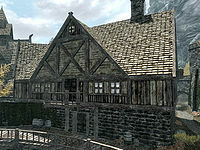 Black-Briar Manor is the Black-Briars' residence in Riften. It is the home of Maven Black-Briar, her son Hemming Black-Briar, and her grand-daughter Ingun Black-Briar. Maven's housecarl, Maul, resides here as well. Ingun spends most of her day in Elgrim's Elixirs, and returns at night to sleep. This is an easy target for thieves as it is likely to be unoccupied most of the day. It contains only one zone, the interior. * These NPCs relocate to Mistveil Keep if the Imperial Legion takes over the Rift. Entering the manor brings you into an oddly shaped reception room with a chair to your left, a long end table against the northeast wall, with a note regarding the loss of a shipment of Black-Briar Mead to Cyrodiil on top and a doorway to the right of it. Against the southeast wall is a tall wardrobe and another long end table that holds an iron sword, with a doorway to the right of it. In the western corner is a small sitting area with two chairs and a low table between them. On the table is a bottle of Black-Briar Mead. To the southwest of the door way is a cupboard against the southwest wall holding plates and a bowl. There is a alcove containing several crates, sacks and a couple of Black-Briar Mead barrels. To the northeast is another oddly shaped room with a cupboard holding two bottles of alto wine, a bottle of wine and several goblets. Further around against a wall to the north is a set of shelves holding three bottles of Black-Briar Mead, a bowl and copies of Gods and Worship and The Hope of the Redoran, again further to the right is a set of shelves against the northeast wall with a jug and a copy of The Amulet of Kings with chairs on either side. Another set of shelves against the east wall holds a bunch of tundra cotton, a bowl, a potion of minor stamina and a potion of minor healing. To the right of this is a flight of stairs down to the cellar, with a flight up to the second story behind it and a doorway to the right that enters a corridor that has a second entrance to the Manor and the stairs leading upstairs, to the left and another doorway ahead that enters a dining room, there are several sacks on a crate and a couple of food barrels in this corridor. The second entrance is from the rear garden of the manor which has a gate at the end, a couple of trees, a wooden bench, a lavender bush and three food barrels. The dining room has a long wooden table down the middle and chairs on either side. On the table which is set for five with plates and goblets, are two salmon steaks, a baked potato, two seared slaughterfish, two portions of grilled leeks, several loaves of bread, a sweet roll, a cabbage, some potatoes, a gourd, several pieces of cheese, an apple pie, a bottle of wine and two bottles of Black-Briar Mead. Against the northeast wall is a set of shelves holding several goblets, three bottles of Black-Briar Mead, a bottle of alto wine and a bottle of wine. Against the northeast wall is a long end table with a bunch of tundra cotton on top and to the southeast is a cupboard holding various bowls, jugs, goblets and plates, finally in the western corner is a chair between two small tables that hold a copy of Thief of Virtue and a bottle of wine and a goblet. Climbing the stairs to the second floor leads to a large landing, again oddly shaped. In the northeastern corner is a set of shelves holding a bunch of tundra cotton and copies of Lost Legends and Ruins of Kemel-Ze, with wooden benches to the left and right, against the walls. To the south is another storage area with crates, sacks and a Black-Briar Mead barrel. To the west is a door that opens into Maven's large bedroom with a king-sized bed coming out from the southeast wall, with a long unlocked chest containing random items at the foot of the bed, an end table with a goblet and bottle of alto wine on top and wardrobe containing fine clothes to the left and a long end table holding a letter from Christophe and a letter from Sabjorn and a couple of chairs to the right, with a small table holding a bottle of wine between them. Opposite the chairs is a fireplace with a piece of firewood to the left. Against the northwest wall is a wardrobe containing clothes with a door out onto a small balcony that looks out over the canal and marketplace to the right. Another wardrobe stands in a corner to the north. Opposite the internal door is a set of shelves holding a statue of Dibella, a purple mountain flower, a bunch of tundra cotton and copies of Alduin is Real and The Arcturian Heresy and a final wardrobe is to the right of these. A corridor leads between this bedroom and the storage area to the southwest with two doors on the left and more storage at the end. The first door on the left consists of a single owned bed in the southern corner, with an end table beside it holding a goblet and bottle of alto wine. In the western corner is a wardrobe of fine clothes. Against the southeast wall is a long end table and against the northeast wall is a set of shelves holding a bunch of tundra cotton, an iron helmet, an iron shield and copies of Darkest Darkness, Biography of Barenziah, v1 and v2. The second door enters another bedroom with a single owned bed coming out from the southwest wall, with an end table holding a bottle of alto wine and a goblet to the left and a set of shelves holding a medium coin purse and three bottles of Black-Briar Reserve. At the bottom of the stairs down to the cellar there is a room on the right containing several bales of straw and a couple of piles of wood, with three doors, one to the northeast and two to the northwest. The door to the northeast is Ingun Black-Briar's bedroom and contains a wardrobe against the southwest wall, a single unowned bed in an alcove to the northwest (see notes), an alchemy lab in the northern corner, a set of shelves against the northeast wall holding a chicken's egg, a pine thrush egg, two rock warbler eggs, a bowl of ectoplasm, two Falmer ears, three bowls of bone meal, a sample of fly amanita, a sample of bleeding crown, a blue butterfly wing, a bunch of lavender, six slaughterfish eggs, a skeever tail, a sample of scaly pholiota, two Nordic barnacles, a bunch of jazbay grapes and a bunch of juniper berries. In an alcove to the southeast are a couple of Black-Briar Mead barrels, sacks and crates. The first door to the northwest is master-locked and contains more Black-Briar Mead barrels, a crate, a sack and the remains of a Black Sacrament performed using a skeleton, a human heart, human flesh, a nightshade flower and an iron dagger as explained in the book A Kiss, Sweet Mother, a copy of which is present along with a note to Astrid from Maven Black-Briar, complaining at the lack of action (see notes). The second door to the northwest opens into another bedroom with a single owned bed against the southwest wall, an end table holding a bottle of wine beside it and a wardrobe further to the right of the northwest wall. Ingun's bed in the cellar becomes available to use once you have completed her quest. The human flesh and human heart respawn. There are two Protected shadowmarks around the manor, one by the front entrance and one by a gate at the rear of the property. Maven Black-Briar has strong ties with the Thieves Guild. The letter to Astrid doesn't seem to get sent, as no action is taken, and no quest that is clearly for Maven is given to you to carry out. Aside from most barrels and sacks, all containers in the house are non-respawning and safe to store items in. This page was last modified on 26 March 2017, at 08:18.